If the Volador freeride longboard has been hovering over your mind for a while then our article today will settle it once and for all for you. Diving right into purchasing it without knowing its value can cost you, literally. But, don’t you worry; this is exactly what we are here to fix! We will put down for you the most comprehensive, thorough and honest review of the Volador freeride longboard so that you do not have to keep wondering about it anymore. By the time you finish reading our review, you will already have made up your mind of its credibility. So, will does the Volador freeride longboard really have what it takes to be your thing ride? We will find out soon. Let’s begin! The Volador freeride longboard should be particularly great for downhill and depressed streets and roads thanks to favorable length, but of course, you can use it for day to day commute and treading as well; great replacement for cars, don’t you think so? This longboard from Volador is in the color “leaf green” from the Freeride series. But you are will be able to choose from 3 more colour and variation from this series. And the reason we deemed the Volador freeride longboard, leaf green, appropriate for hilly roadways is all because of the length of the deck of this thing. The dimensions measure 4 x 9 x 42 inches; 42 inches in length is ideal to establish stability (something you really need on downhill roads). On that note, you also get enough foot room on its deck which measures 9 inches in width. As for the weight, it weighs just about 8.5 pounds; not the lightest, we know, but you need this weight bulkiness on longboards in order for it to stay put when are on it. Either way, the length, width, and breadth of a longboard are crucial, and Volador has pretty much nailed it with the leaf green. The weight is also just light enough for it to be carried around on the back of your backpack or your hands in times you are inactive on it. The deck on a longboard dictates a lot in terms of performance and comfort. The Volador freeride longboard uses a slightly curved and concaved deck to glide through the wind without much resistance. It also acts to provide much-needed comfort to the user’s feet while they are on it. The “almost pointy” nose and tail of the deck also helps you to cut through the wind and catch speed. The drop through trucks on the Volador freeride longboard also gives this longboard its magic. Drop through trucks eliminate the distance between the deck and the ground much more than trucks that are simply drilled onto the bottom only. The lesser the distance, the more control you have on your longboard. Through this, you will enjoy the added benefit of further more stability, especially when you are cruising down a steep road at high speeds. A common rule of thumb on picking out great downhill longboards is to not buy trucks less than 180 mm; it is also recommended that you get boards with truckers that have a 44 to 48 degree base plate. And the Volador freeride longboard complies with the size of the truck very well, but it does fall back in terms of the base plate. It has a base plate of 40 degrees, which isn’t bad per se but isn’t too great either for a downhill longboard. It’s all about balance and stabilization at the end of the day, folks. Wheels are judged by diameter (size) and durometer (hardness). 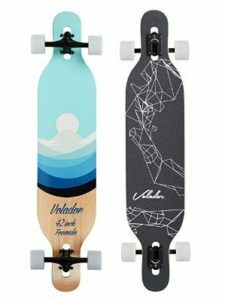 Considering that the Volador freeride longboard is designed to be a downhill longboard, it should have wheels at least 70 mm or more and hardness of 78A *. And the Volador freeride longboard complies! It has 70mm x 51 mm wheels and has the hardness of 78A. *If you may be wondering what hardness of 78a depicts, it simply denotes the level of hardness. The lower the number, the softer the wheels. Softer wheels don’t always mean a bad thing; it does have more gripping power than the harder ones. The Volador freeride longboard uses an ABEC 9 bearing. A ceramic bearing would have been more preferable since they are most durable at the end of the day. The deck of the Volador freerides longboard uses Maple in its making; 8 layers of it to be exact. It is topped off with a grip to grip onto the user’s foot. The trucks are made out of aluminum die casting that repels rust and corrosion. The quality components that have been used to construct it surely seem promising but unfortunately, numerous consumers report beg to differ. 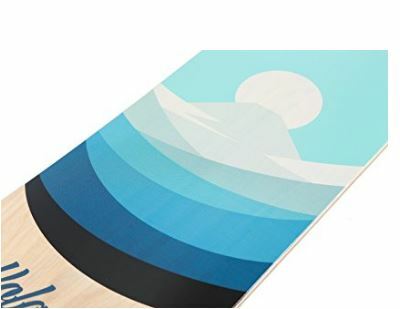 The Volador freeride longboard, leaf green, has a beautiful black skin on top of the deck, and the bottom has mix of several blues; you have printed brand logos on both sides. These have been meticulously heating transferred. The contrast of the white wheels and the black trucks really does a great job catching eyes. All in all, it looks fun, laid back and youthful! Very appealing, indeed. What is the weight limit for the Volador freeride longboard? Answer: The weight limit on this longboard is about 250 pounds. Answer: glad you asked this. And no, it wouldn’t. It has been built as a cruiser and almost serves as a downhill longboard. It is nearly nothing like a skateboard to do tricks on. We are a little confused about the Volador freeride longboard ourselves at this point. Don’t get us wrong, it is a brilliant board for the price it is being sold at but it just seems to serve, you know? And the one and the only issue we had from it are its sense of quality and durability. Despite claiming to use such great quality complements and parts, it has snapped and cracked on many users on many occasions. To be honest, this just isn’t making the cut for us; we wouldn’t recommend it. We put forward our report of the Volador freeride longboard, but the final and most say is always yours. Good luck! We are running the volador brands. Shall we talk about cooperation? Howdy just wanted to give you a quick heads up. The text in your article seem to be running off the screen in Opera. I thought I’d post to let you know. The design look great though!